If your business is like most businesses, you've gotten your feet wet in the digital/online marketing waters by now, and you've probably realized one of the biggest challenges facing online marketing is generating content. A great web presence requires a lot of great material. Creating content, whether for print or online audiences, can be both time-consuming to produce and costly to purchase. So what's a small to medium sized business to do? Chances are, you have a lot of business-related print material on hand. If so, you may be looking at a treasure trove you can repurpose to help you meet your online channels' demand for content. And even better, reusing print content is an efficient and cost-effective way to help you meet your digital content needs. Are you wondering if you can just grab your print content and put it online? This might sound like a reasonable approach, especially since a lot of your print material is likely marketing-related and has probably already proven its effectiveness at meeting your marketing goals. Unfortunately, this is one of the worst approaches you can take when it comes to recycling your print content. Why? The reason lies in the structure of each type of content. Sure, there are some similarities. Both need to be compelling, giving the reader a reason to keep reading. But copy written for print tends to follow a linear structure; the writer is able to guide the reader from point A to B to C. In essence, in print you are able to take the reader by the hand straight through to your call to action. Online content has a very different structure. Open up any web page and what do you see? Rather than a linear path through the material, a Web page follows a branching type of structure. Online readers have a multitude of points through which they can navigate to find more material that meets their interests. And it's not just traditional website content, either. Social media posts are structured very differently from print media. In most social media posts, information is conveyed through just a handful of words coupled with an appealing image. And with certain social media platforms, the image forms the thrust of the message, while words play a much smaller role. Clearly, you can't just throw your print material up online and expect it to perform well. So what is a good approach? Your first step is to gather together all the print content you have. And here's a key point: look beyond your marketing materials. Your first thought may be to round up all the brochures you hand out to customers, the newsletters you offer to clients, press releases-in short, everything in your print marketing arsenal. But don't stop there. Content you can repurpose is everywhere: fact sheets, reports, presentations, employee handbooks, training manuals, product instruction manuals, product catalogs, white papers, annual reports, case studies, policy and procedure manuals, internal memos, in-house videos, customer information guides. Even packaging materials can provide valuable content you may be able to repurpose. Now that you've amassed your bounty of print material, it's time to break everything down into parts. By reducing your best materials to component parts, you can see how your content can be repurposed in a useful, meaningful way for an online audience. visuals such as images, graphs, tables and charts. As you're doing this, keep track of the various themes and topics that appear. Be especially aware of titles, headings and subheadings, as these will often suggest natural groups for your content. Once you've broken down your relevant print materials into their component parts, what next? How do you go about using all the things you've found? Remember that your goal is not to duplicate your content for an online medium. What you want your repurposed content to do is enhance or supplement the printed piece. Ideally, you don't want your audience to notice the content is repurposed content. How do you go about doing this? Now is the time to consider the type of online content you want. Do you need blog posts? Perhaps articles for your site? Maybe social media posts? It's especially important to remember the purpose for your recycled content will be different from your purpose for the original piece of content. By considering each of the factors outlined above, you will be able to see what needs to be changed in each component part you've pulled from your stash of print content. Now that you've done the preparatory work, it's time to begin the task of repurposing. Think about how you can get the most out of each of these types of content. For example, if you're repurposing something in a training manual into an online tutorial, evaluate all the possible forms a tutorial could take. Look at the material you're working with and consider what it's best suited for: A video? A step by step static page guide with a lot of visuals? A slideshow presentation? Maybe you have access to a web developer or web design pro and can make an interactive page for the article with tools, quizzes, or other fun-to-use content. Create new introductions or summaries that work with the material you're repurposing. Write more descriptions and other copy to expand on presentations or other pieces that utilize a lot of images or graphics. Keep an eye out for opportunities to link to your other online channels, whether it's posts on your blog, other pages on your website or your social media platforms. Reinforce the SEO (search engine optimization) effectiveness of your repurposed pieces by adding relevant and appropriate keywords. Most print content will not contain enough keywords for proper SEO, so your repurposing session is a good time to make sure your recycled pieces have the keyword power to draw visitors from the search engines. Slideshare presentations. Have you or your staff put in a lot of time on a PowerPoint presentation? Don't let all that hard work go to waste. Try transforming useful and relevant presentations into online content that can be easily embedded into your website. Not sure where to start? Slideshare offers users six tips for repurposing content on Slideshare. Blog post series. Remember those mini-themes you jotted down as you went through your pile of print content? Chances are, they probably came from some type of long-form documents, such as reports, white papers or case studies. Or perhaps the mini-themes popped out at you from a presentation. No matter the source, consider designing a series of blog posts around one of these mini-themes, using the content you've pulled from your original print source as the basis for each post in the series. Polls and surveys. Your print content can offer great insights into your customers. Build on these insights by designing a poll or survey you can embed on your site or link to via social media platforms. The data you gather from these surveys can give you ideas for articles or other online content that provide answers for your customers. Infographics. If you or your staff have spent any time at all collecting data, chances are much of that information has found its way into various forms of your print content. Consider putting together an infographic based on the data or statistics you've generated. If you haven't done this before, there are a number of free tools available online to help with the task. For example, Canva is a multi-featured online design tool that offers an easy, drag-and-drop infographics creator. Guest posts. Leverage the power of external links to your Web properties by repurposing your print content into guest posts for other sites. Use copy and images from brochures, manuals, handbooks and white papers to create posts that will showcase your business's particular expertise. to generate shareable video content. 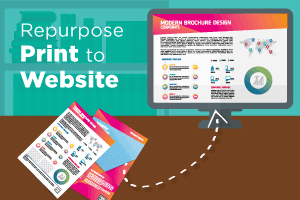 These are just a few ideas for repurposing your existing print content for your website. As you become more comfortable reusing the copy and images your business has already created, you'll find more and more ways to turn valuable print content into equally valuable online material.